This property is in a nice community filled with 4 pools, playgrounds for the kids, tennis, basketball, and vollyball courts! It's very well maintained and provided the "home" vs "hotel" feel we were looking for. With 4 bedrooms and 3 bathrooms there was plenty of space and 2 masters was a nice perk! Excellent personality very professional, it was a pleasure working with Angie. Excellent stay with the exceptions of comments left about. My family enjoyed their stay. Angela was to me, one of the nicest people I have had the pleasure of talkin with. She is simply the best. The best way to describe our stay is relaxed and content. We had a warm very homey feeling being there and felt very safe and secure. We left there feeling almost lost and sad to go because it was so wonderful. We shall return, Eric & Cecilia. Great location to Disney Parks and Universal Studios! We loved the property. Clean almost like being at home. The swimming pool and hot tub were a big hit. My experience with working with members of your team was excellent. Everyone was very quick to respond to all of my questions and needs. This gated community was very nice and quiet. We have nothing but good things to say about this beautiful townhome in Regal Palms! We stayed here for 7 nights and loved every minute of it. Everything in the home was well maintained and very clean. There was more than enough room for my family of 6. The pool on the resort was great too. I love the fact that unlike other homes in Regal Palms, this one truly is a short walk to the pool and clubhouse. We could see the top of the waterslide from our living room! That was a definite bonus for us. Another great thing about this townhome is that it is a short drive to Disney World! 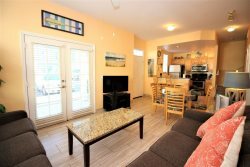 We would recommend this townhome to anyone looking for a place to stay near Disney and would definitely stay here again! Thank you for such an enjoyable experience and a lovely home!